Our Town Tuesday - Contain Yourself! Our Town Tuesday – Contain Yourself! On Fortune’s list of 100 Best Companies To Work For, The Container Store comes in at #22. The Coppell based company recently held a Grand Opening at their new Arlington location, the old Borders, in the Highlands shopping center. 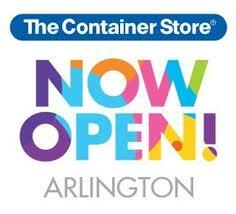 The Container Store used to have a location in Arlington some years ago but decided to make the move to Southlake thinking their customers would follow, turns out they didn’t. However, it looks as though the new Arlington location will see some great success. This was a grand opening that looked like lots of fun, with dancing, food, and wine! As the Arlington area continues to grow, more and more retailers are moving to places like the Highlands. Cotton Patch Café, offering home-style cooking, will begin construction in the Highlands this spring with plans to open soon after. Retailers and restaurants flocking to Lincoln Square, including Blue Mesa Grill, Ulta, and Michaels Arts and Crafts, hope to piggy-back off tourists and visitors who will come to Arlington for entertainment at Six Flags, Rangers Ballpark, and Cowboys Stadium. One thing that businesses need to stay productive and maintain growth is to know who their audience is, what they are buying, where they are located, etc… When entering any market, research and data are gathered prior to making any kind of business decisions, especially when opening a new location. More and more, businesses are use information to find out everything they can about their customers and what drives them to their stores. Take for instance Target, the second largest retailer in America behind Walmart, who can predict a woman’s due date (yes Target knows when you are pregnant ladies!) within a very small window based on the products she starts to buy at the start of her pregnancy. When carefully studying one’s buying habits, with the help of experts, Target learned how to predict when we go through certain life events. Another finding was that when couples get married they tend to switch coffee brands, when they move into a new home they might start purchasing a different cereal. These fascinating findings can greatly improve and alter the path a business takes to reach its customers. So I ask, how well do you know your customers?